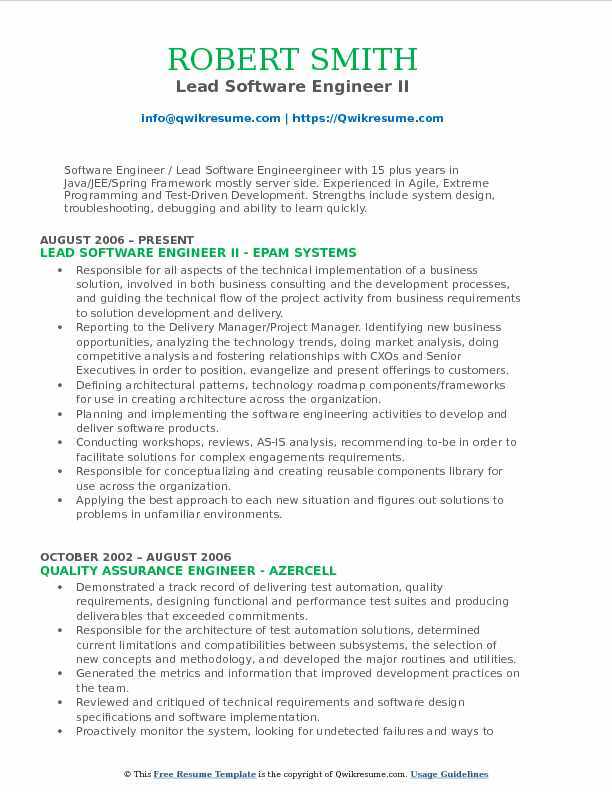 A Lead Software Engineer develops information systems by designing, developing, and installing software solutions. One of the key responsibility of a Lead Software Engineer is to support and develop the software team. 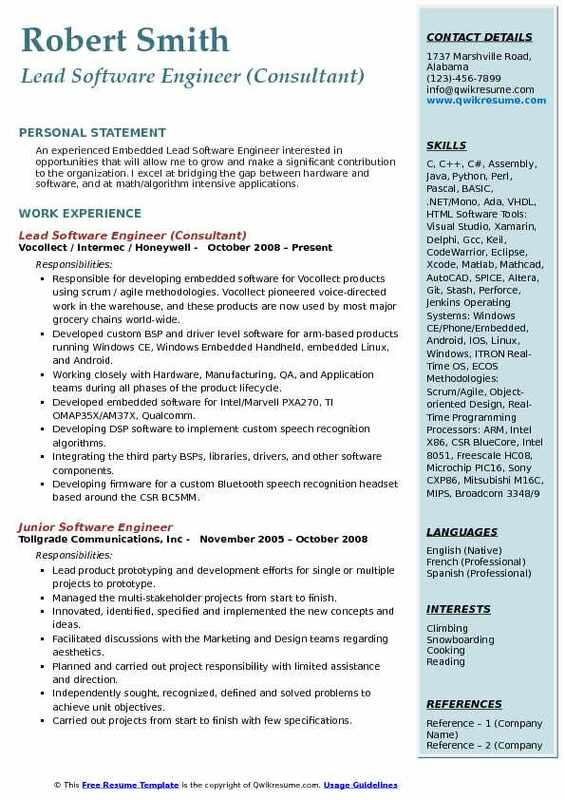 Some of the other responsibilities listed on a Lead Software Engineer Resume includes: determining operational feasibility of a project, developing required documentation for clients, preparing and installing solutions, conducting system analysis, supporting and guiding Software Engineers and Junior Software Engineers. 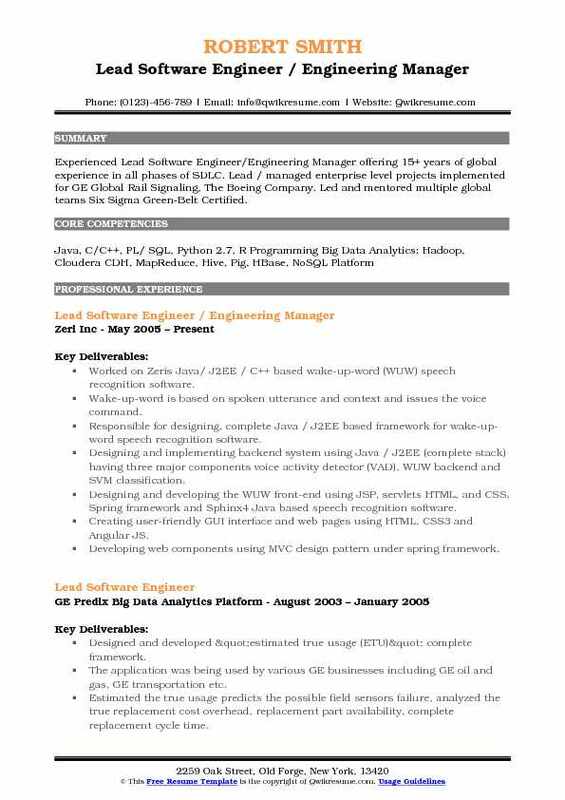 Some of the important skills of a Lead Software Engineer are: analyzing information, designing software, knowledge about documentation and testing, good programming skills, the fundamental idea about everything related to software development, up to date knowledge on current affairs in the field of software. 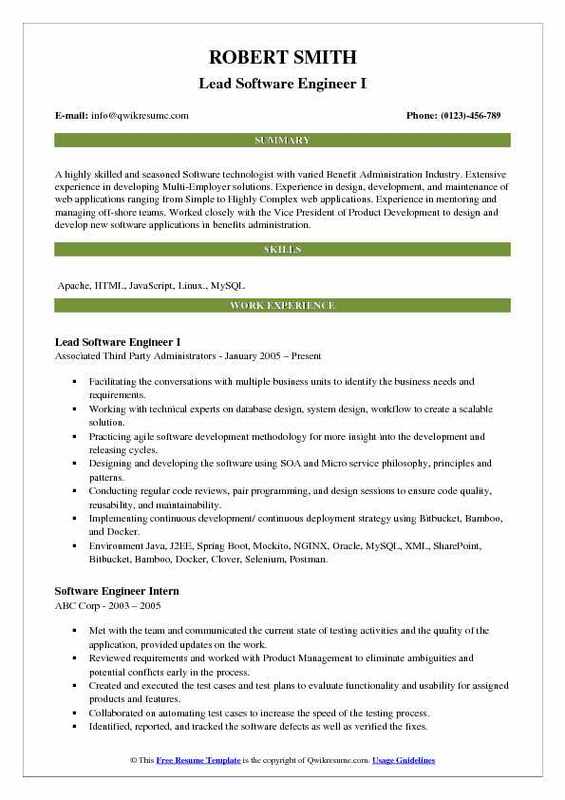 The minimum educational qualification expected for this role is a Bachelor’s Degree in Computer Science and Engineering or Information Technology and several years of relevant work experience. 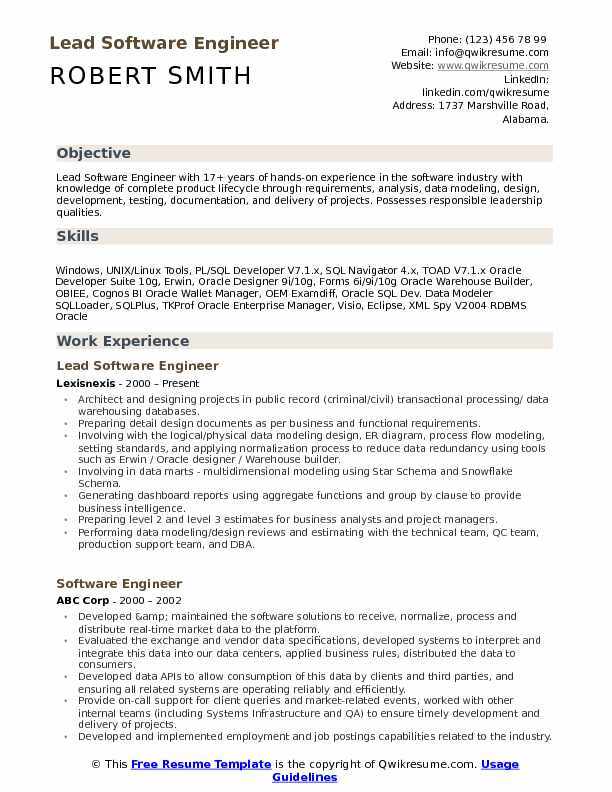 Summary : Lead Software Engineer with 17+ years of hands-on experience in the software industry with knowledge of complete product lifecycle through requirements, analysis, data modeling, design, development, testing, documentation, and delivery of projects. Possesses responsible leadership qualities. Architect and designing projects in public record (criminal/civil) transactional processing/ data warehousing databases. Preparing detail design documents as per business and functional requirements. Involving with the logical/physical data modeling design, ER diagram, process flow modeling, setting standards, and applying normalization process to reduce data redundancy using tools such as Erwin / Oracle designer / Warehouse builder. Involving in data marts - multidimensional modeling using Star Schema and Snowflake Schema. Generating dashboard reports using aggregate functions and group by clause to provide business intelligence. Preparing level 2 and level 3 estimates for business analysts and project managers. Performing data modeling/design reviews and estimating with the technical team, QC team, production support team, and DBA. Researching and analyzing the requirements to design the most efficient process flow algorithms. Building templates, reusable look-up values, and generic modules for rapid development and maintenance. 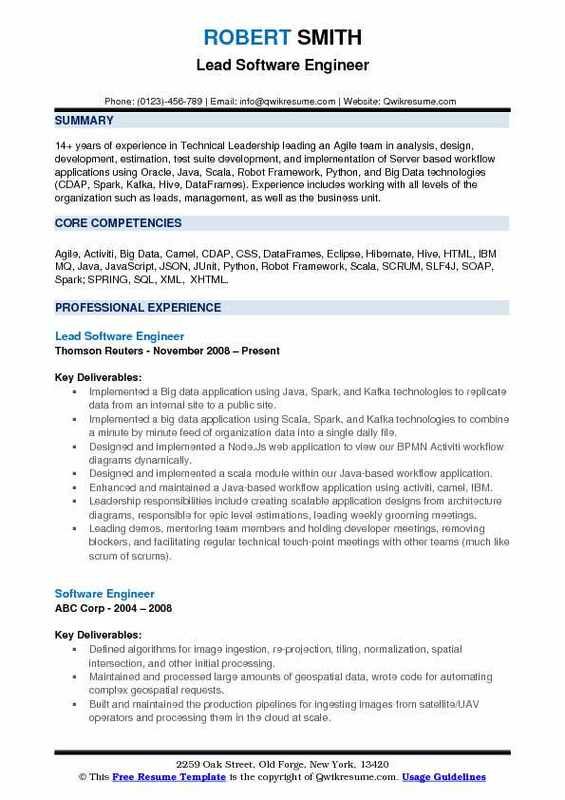 Summary : 14+ years of experience in Technical Leadership leading an Agile team in analysis, design, development, estimation, test suite development, and implementation of Server based workflow applications using Oracle, Java, Scala, Robot Framework, Python, and Big Data technologies (CDAP, Spark, Kafka, Hive, DataFrames). Experience includes working with all levels of the organization such as leads, management, as well as the business unit. Implemented a Big data application using Java, Spark, and Kafka technologies to replicate data from an internal site to a public site. Implemented a big data application using Scala, Spark, and Kafka technologies to combine a minute by minute feed of organization data into a single daily file. Designed and implemented a Node.Js web application to view our BPMN Activiti workflow diagrams dynamically. Designed and implemented a scala module within our Java-based workflow application. Enhanced and maintained a Java-based workflow application using activiti, camel, IBM. Leadership responsibilities include creating scalable application designs from architecture diagrams, responsible for epic level estimations, leading weekly grooming meetings. Leading demos, mentoring team members and holding developer meetings, removing blockers, and facilitating regular technical touch-point meetings with other teams (much like scrum of scrums). Responsible for updating documentation (team wiki), consumer guides, and production. Keeping team epics on track and within deadline, past three projects have been delivered on time. Summary : A highly skilled and seasoned Software technologist with varied Benefit Administration Industry. Extensive experience in developing Multi-Employer solutions. Experience in design, development, and maintenance of web applications ranging from Simple to Highly Complex web applications. Experience in mentoring and managing off-shore teams. Worked closely with the Vice President of Product Development to design and develop new software applications in benefits administration. Facilitating the conversations with multiple business units to identify the business needs and requirements. Working with technical experts on database design, system design, workflow to create a scalable solution. Practicing agile software development methodology for more insight into the development and releasing cycles. Designing and developing the software using SOA and Micro service philosophy, principles and patterns. Conducting regular code reviews, pair programming, and design sessions to ensure code quality, reusability, and maintainability. Implementing continuous development/ continuous deployment strategy using Bitbucket, Bamboo, and Docker. Environment: Java, J2EE, Spring Boot, Mockito, NGINX, Oracle, MySQL, XML, SharePoint, Bitbucket, Bamboo, Docker, Clover, Selenium, Postman. Developing a web-based solution for participants, in benefits industry, to access benefits information, obtain forms, run benefit estimates and communicate with their plan administrators at the click of a button. Developed customized java based solutions utilizing atg dynamo 5.6.1 framework. Designed and developed custom ATG servlet pipeline, custom ATG form handlers, custom ATG droplets. Architected, designed and developed multiple modules within the project using ATG framework to cater specific needs of specific clients in a multi-tenant architecture. 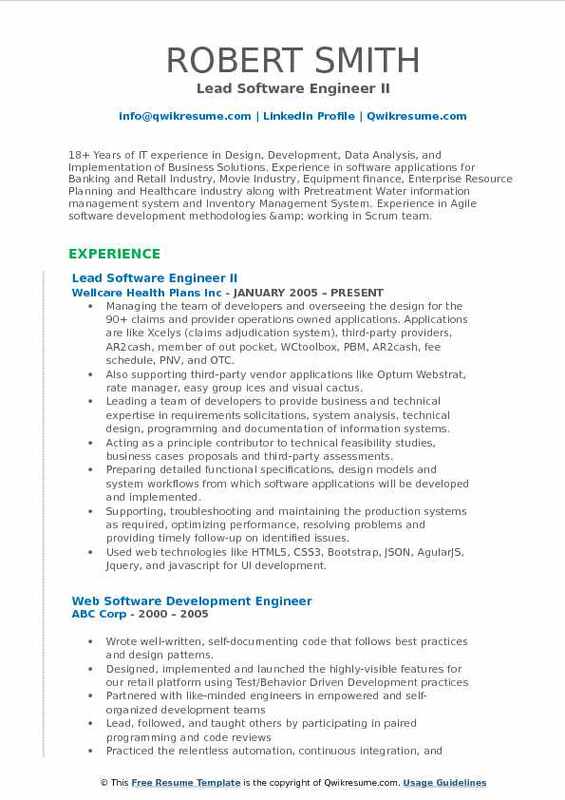 Summary : 18+ Years of IT experience in Design, Development, Data Analysis, and Implementation of Business Solutions. Experience in software applications for Banking and Retail Industry, Movie Industry, Equipment finance, Enterprise Resource Planning and Healthcare industry along with Pretreatment Water information management system and Inventory Management System. Experience in Agile software development methodologies & working in Scrum team. Managing the team of developers and overseeing the design for the 90+ claims and provider operations owned applications. Applications are like Xcelys (claims adjudication system), third-party providers, AR2cash, member of out pocket, WCtoolbox, PBM, AR2cash, fee schedule, PNV, and OTC. Also supporting third-party vendor applications like Optum Webstrat, rate manager, easy group ices and visual cactus. Leading a team of developers to provide business and technical expertise in requirements solicitations, system analysis, technical design, programming and documentation of information systems. Acting as a principle contributor to technical feasibility studies, business cases proposals and third-party assessments. Preparing detailed functional specifications, design models and system workflows from which software applications will be developed and implemented. Supporting, troubleshooting and maintaining the production systems as required, optimizing performance, resolving problems and providing timely follow-up on identified issues. Developed AngularJS controllers which isolates scope to perform operations in UI. Developed services and injected them into controllers using di angularjs. Developed various controllers with action methods returning varied action results like file content, script execution, JSON data, URL redirection and HTTP status. Summary : An experienced Embedded Lead Software Engineer interested in opportunities that will allow me to grow and make a significant contribution to the organization. I excel at bridging the gap between hardware and software, and at math/algorithm intensive applications. Responsible for developing embedded software for Vocollect products using scrum / agile methodologies. Vocollect pioneered voice-directed work in the warehouse, and these products are now used by most major grocery chains world-wide. Developed custom BSP and driver level software for arm-based products running Windows CE, Windows Embedded Handheld, embedded Linux, and Android. Working closely with Hardware, Manufacturing, QA, and Application teams during all phases of the product lifecycle. Developed embedded software for Intel/Marvell PXA270, TI OMAP35X/AM37X, Qualcomm. Developing DSP software to implement custom speech recognition algorithms. Integrating the third party BSPs, libraries, drivers, and other software components. Developing firmware for a custom Bluetooth speech recognition headset based around the CSR BC5MM. Developing automated tests to validate software functionality in a continuous integration. Developing cross-platform speech recognition workflow applications on Android, IOS. Designed and successfully productized custom algorithms to facilitate real-time battery. Summary : Lead Software Engineer and Consultant with 11 plus years of experience with a solid understanding in all the phases of the Software Development Lifecycle (SDLC), this includes Analysis, Design, Development, Testing and Maintenance of UI applications. Leading the team of 6 associates, guided technically in completing their assigned user stories within the iteration. Integrated BabelJS to transpile the code of ES6 to eS5 while building the final production code. Implemented CSS classes using less as a preprocessor for the components CSS. Involving in the planning of iterations for a release with Solution Designers, UX team, and Test Analysts. Involving in designing the components, coding, UI reviews and writing the technical design documents. Using the GIT for code repository and JIRA for iteration planning and bug tracking. White box testing is done to make sure the code is stable and not crashing anywhere and there no issues related to the data. 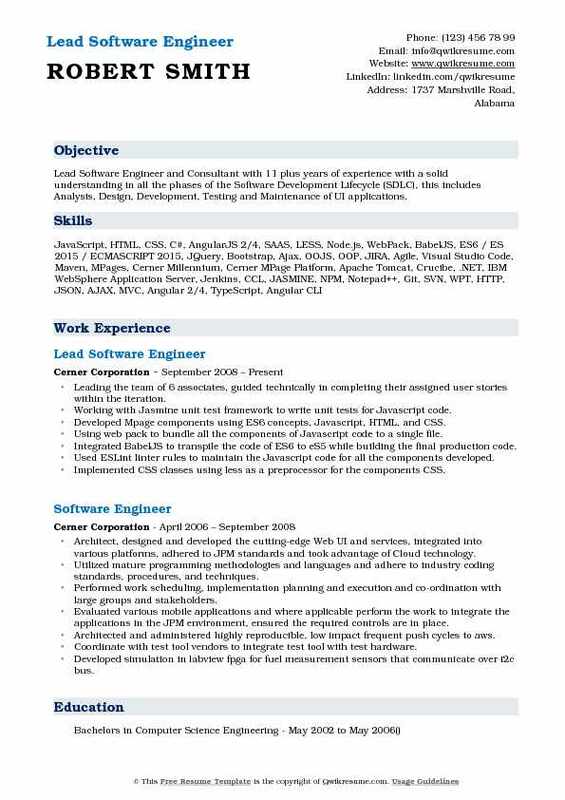 Summary : Software Engineer / Lead Software Engineergineer with 15 plus years in Java/JEE/Spring Framework mostly server side. Experienced in Agile, Extreme Programming and Test-Driven Development. Strengths include system design, troubleshooting, debugging and ability to learn quickly. Responsible for all aspects of the technical implementation of a business solution, involved in both business consulting and the development processes, and guiding the technical flow of the project activity from business requirements to solution development and delivery. Reporting to the Delivery Manager/Project Manager. Identifying new business opportunities, analyzing the technology trends, doing market analysis, doing competitive analysis and fostering relationships with CXOs and Senior Executives in order to position, evangelize and present offerings to customers. Defining architectural patterns, technology roadmap components/frameworks for use in creating architecture across the organization. Planning and implementing the software engineering activities to develop and deliver software products. Conducting workshops, reviews, AS-IS analysis, recommending to-be in order to facilitate solutions for complex engagements requirements. Responsible for conceptualizing and creating reusable components library for use across the organization. Applying the best approach to each new situation and figures out solutions to problems in unfamiliar environments. Reviewing non-functional requirement (NFR) compliance in order to ensure optimal large-scale solution. Developing technical requirements (Scoping) and preparing size and effort estimation. Producing technical aspects of the project like high-level designs and architecture. Summary : Experienced Lead Software Engineer/Engineering Manager offering 15+ years of global experience in all phases of SDLC. Lead / managed enterprise level projects implemented for GE Global Rail Signaling, The Boeing Company. Led and mentored multiple global teams Six Sigma Green-Belt Certified. Worked on Zeris Java/ J2EE / C++ based wake-up-word (WUW) speech recognition software. Wake-up-word is based on spoken utterance and context and issues the voice command. Responsible for designing, complete Java / J2EE based framework for wake-up-word speech recognition software. Designing and implementing backend system using Java / J2EE (complete stack) having three major components: voice activity detector (VAD), WUW backend and SVM classification. Designing and developing the WUW front-end using JSP, servlets HTML, and CSS, Spring framework and Sphinx4 Java based speech recognition software. Creating user-friendly GUI interface and web pages using HTML, CSS3 and Angular JS. Developing web components using MVC design pattern under spring framework. Recording and processing the voice command in the several formats then send to the backend for further processing. Responsible for analyzing the backend system and convert voice extraction into java based classification system using Sphinx-4 speech recognition system. Performed necessary XML configuration for Hibernate for DB connectivity. WUW achieved >99% accuracy and correct rejection of Non-WUW with 100% accuracy to guarantee 0% false acceptance. 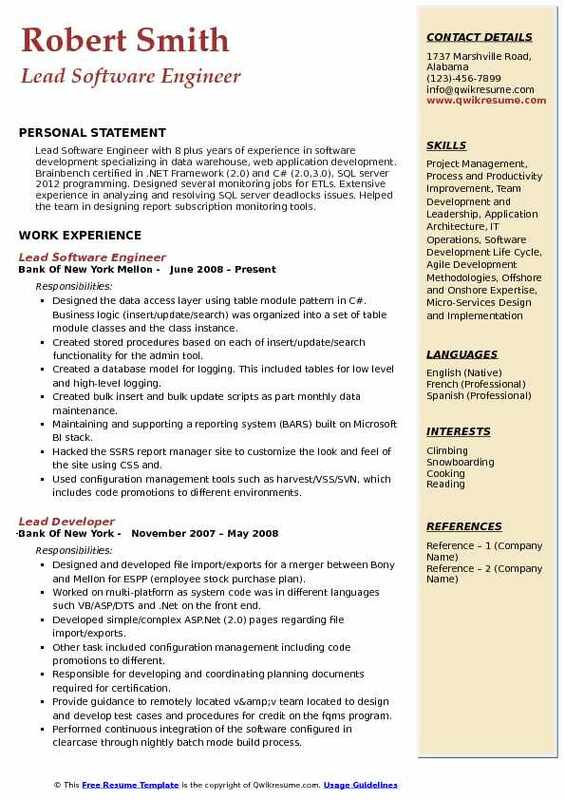 Summary : Lead Software Engineer with 8 plus years of experience in software development specializing in data warehouse, web application development. Brainbench certified in .NET Framework (2.0) and C# (2.0,3.0), SQL server 2012 programming. Designed several monitoring jobs for ETLs. Extensive experience in analyzing and resolving SQL server deadlocks issues. Helped the team in designing report subscription monitoring tools. Designed the data access layer using table module pattern in C#. Business logic (insert/update/search) was organized into a set of table module classes and the class instance. Created stored procedures based on each of insert/update/search functionality for the admin tool. Created a database model for logging. This included tables for low level and high-level logging. Created bulk insert and bulk update scripts as part monthly data maintenance. Maintaining and supporting a reporting system (BARS) built on Microsoft BI stack. Hacked the SSRS report manager site to customize the look and feel of the site using CSS and. Used configuration management tools such as harvest/VSS/SVN, which includes code promotions to different environments. Using visual studio reporting service (SSRS) and officer writer plugins to create complex multi-tab. Performing daily data analysis by using complex MDX queries derived from proclarity code behind administered the OLAP Cube via SSAS. 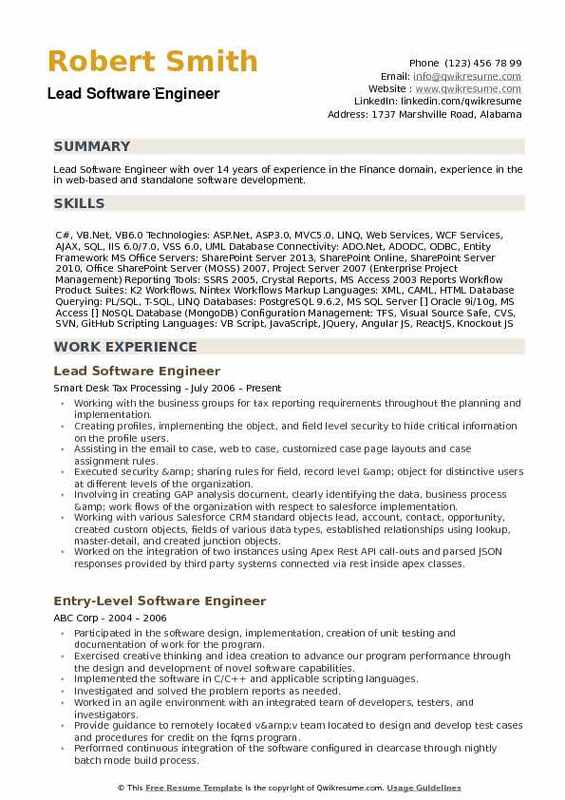 Summary : Lead Software Engineer with over 14 years of experience in the Finance domain, experience in the in web-based and standalone software development. Working with the business groups for tax reporting requirements throughout the planning and implementation. Creating profiles, implementing the object, and field level security to hide critical information on the profile users. Assisting in the email to case, web to case, customized case page layouts and case assignment rules. Executed security & sharing rules for field, record level & object for distinctive users at different levels of the organization. Involving in creating GAP analysis document, clearly identifying the data, business process & work flows of the organization with respect to salesforce implementation. Working with various Salesforce CRM standard objects lead, account, contact, opportunity, created custom objects, fields of various data types, established relationships using lookup, master-detail, and created junction objects. Worked on the integration of two instances using Apex Rest API call-outs and parsed JSON responses provided by third party systems connected via rest inside apex classes. Deployed code across various sandbox using force. Com ide, change set, workbench and force. Com migration tool, prepared package. Xml for workbench and force.com migration tool. Developed Apex classes, controller classes, extensions and apex triggers for various tax reporting needs in the application. Designed various web pages in visualforce for capturing various customer enquiries and involved and implemented partner community.